Nineteen-year-old Nayeli works at a taco shop in her Mexican village and dreams about her father, who journeyed to the US when she was young. Recently, it has dawned on her that he isn't the only man who has left town. In fact, there are almost no men in the village--they've all gone north. While watching The Magnificent Seven, Nayeli decides to go north herself and recruit seven men--her own "Siete Magníficos"--to repopulate her hometown and protect it from the bandidos who plan on taking it over. 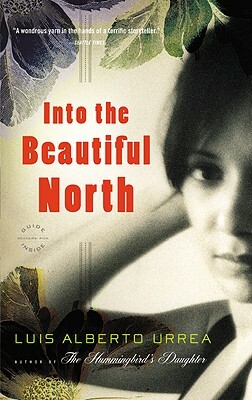 Filled with unforgettable characters and prose as radiant as the Sinaloan sun, Into the Beautiful North is the story of an irresistible young woman's quest to find herself on both sides of the fence. Luis Alberto Urrea is the author of The Devil's Highway, The Hummingbirds Daughter, and Across the Wire. Winner of a Lannan Literary Award, and the Christopher Award, he is also the recipient of an American Book Award, a Western States Book Award, and a Colorado Book Award. In 2001, Luis was inducted into the Latino Literary Hall of Fame.